Sami loves unicorns! Of course I had to make this unicorn pillow for her. 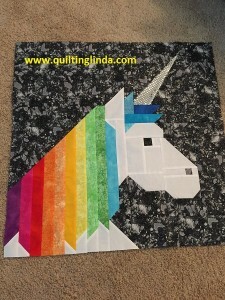 This is an Elizabeth Hartman pattern called “Lisa the Unicorn”. The fabrics in the mane are from a collection of fat quarters that I have in my fabric stash. The horn is a scrap of sequined fabric that was left from a prom dress that I made for her mom in 1997. The background fabric is a sparkly piece that Sami chose when we went shopping last week. She also chose a piece for the pillow back that has unicorns and castles. This will be a 26 inch pillow when finished.